Send an English garden someone's way with this gorgeous arrangement. Tendrils of green ivy trail delicately from a beautiful bunch of cream-colored and lavender roses with lavender waxflower for a bouquet that's both traditional and unexpected. 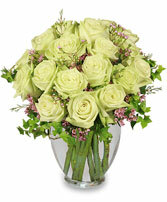 Creme Roses And Lavender Roses, Lavender Waxflower And Ivy Are Perfectly Arranged In A Ginger Glass Vase, Orientation: Allaround. Ginger Vase, Foliage: Ivy, Green Roses (Jade), Pink Waxflower. 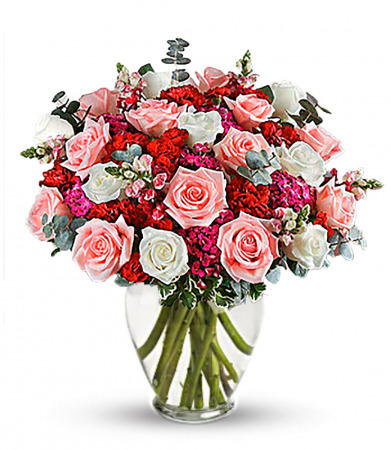 This Brilliant Bouquet Of Lush Roses, , Carnations And Misty Accented With Bupleurum And Variegated Pittosporum, Orientation: Onesided. Pop goes the pink! A gorgeously chic gift for any occasion, this perky pink and orange bouquet is pure fun, especially when it's hand-delivered in our fabulous Cube! 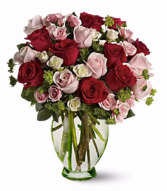 The Lush Bouquet Includes Red Roses, Pink Roses, White Spray Roses And Light Pink Spray Roses Accented With Assorted Greenery, Delivered In A Clear Glass Couture Vase, Orientation: Allaround. 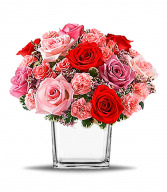 Show her your romantic side big-time with gorgeous red, pink and white roses spectacularly presented in a trendy clear glass couture vase. She'll fall in love with you all over again.